The low end of the single-family market has several candidates for study. These are Boston's satellite cities, all of which at one time prospered as manufacturing centers and all of which had declined by the 1950s after industry moved south. Lawrence's median household income is at the low end of the Greater Boston range, as is its median single-family price. At the same time, it has a substantial component of single-family houses, which were developed through the 1950s. It had about 80% as many transfers of single-family houses as Malden in any year from 1987 to 2015. 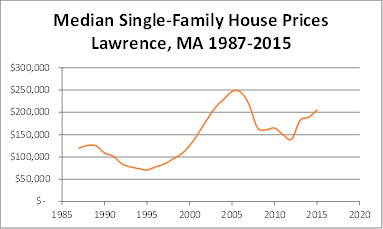 The median price trend for Lawrence single-families from1987 to 2015 is shown in the chart that follows. It shows prices declining through 1995 more strongly than they did in Malden, followed by a surge equal to that of Malden through 2005, followed again by decline, with a recent rise. 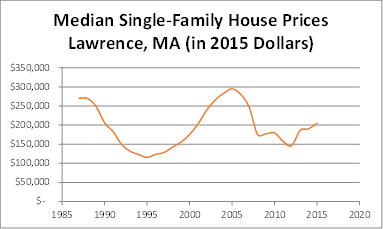 Lawrence, unlike Malden, has not yet returned to the price level of the 2005 peak. Lawrence's median house in 2010 was similar to the median-priced house of 1990, indicating again that the price changes do not appear to be the result of the houses themselves changing in size or quality. In 1991, the 51-year-old (1940) ranch house at 44 Dunstable Street, a 1,026-square-foot house on a 10,000-square-foot site, sold at a price near the 1991 median. In 2010, the 53-year-old (1957) ranch house at 124 Mt. Vernon Street, a 1,120-square-foot house on a 7,500-square-foot site, sold at a price near the 2010 median. Similar houses continued to sell at the median price. The second graph shows the Lawrence median single-family price time-adjusted to 2015 dollars. It shows the Lawrence median declining by nearly 60% from 1987 to 1995, then rising to surpass the 1987 median by 10% by 2005, then declining to about half the 1987 median and reaching 75% of the 1987 median by 2015. In real dollars, with the effect of inflation stripped away, after 2006, Lawrence never again reached the median price level of 1987.